everything LEB: Stripes like what what! Total hotness for a fab NYC couple. Love it! This couple has style! I love it ~~ very cool! L, did you read the NY times article that accompanied these photos? You should check it out--it's somewhat hilarious. While I ultimately liked how their apartment turned out, it was pretty funny to see this couple's relationship with the interior designer who helped them out. She put antlers over the tv and the wife was so not okay with that. Saw this article last week and almost wrote about it myself. I really liked what the designer did with the small space. Gorgeous! I love what the designer did and the final product! It looks amazing! the article was pretty interesting. 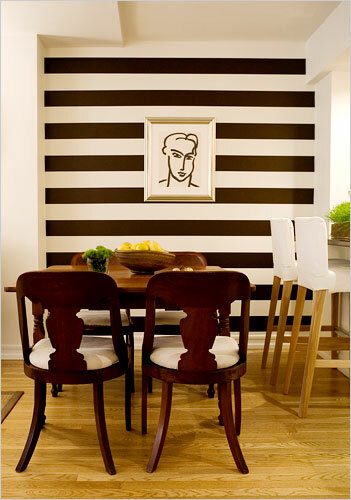 I LOVED this striped wall.